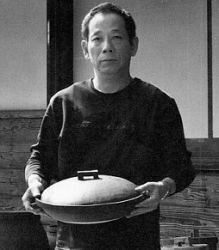 OHMICHI Masao's main output is Japanese pots and pans. Pots and pans are used in daily life for cooking shabu-shabu, sukiyaki, stew, steamed rice, pasta, yudohu (hot tofu) and more in Japan. 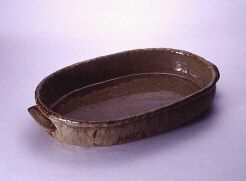 His crockery can be loosely translated as 'casserole,' which are usually used for cooking over a direct flame. 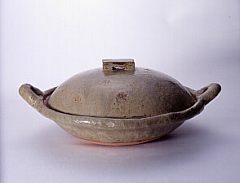 The firing technique and temperature is key to prevent OHMICHI's pans from cracking over a direct flame. OHMICHI would like people to enjoy his wares by using their imaginations.  According to OHMICHI, one can find unpredictable pleasures by serving feasts, or simply using the pots for flower arrangements. His various designed pots and pans match everyday simple meals or add a classy touch to special occasions.